Miracle Method’s refinishing process can be used on several different types of bathroom and kitchen fixtures and countertops. We have a proprietary process that works on materials including porcelain, fiberglass, acrylic, cast iron, and cultured marble sinks, bathtubs and countertops. If you have a porcelain or enamel over cast-iron kitchen sink that is looking like its seen better days, why not consider refinishing it? What some people don’t realize once they’ve decided to renovate their kitchen is that when it comes to significantly improving the appearance and feel of the space, you have options. 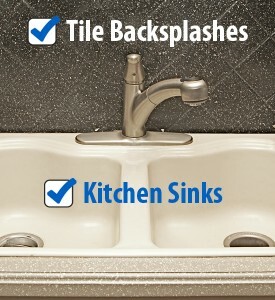 Our refinishing process can restore the smooth, shiny, spotless look your kitchen sink had back when it was brand new. The end results are impressive, but the process is fairly simple and can be completed in as few as 1-2 days. It begins with us cleaning the sink, fixing the chips and cracks and then sanding down the repairs. After that, a proprietary MM4 bonding agent is applied to the sink. This bonding agent is a big part of what makes our refinishing process one of the best in the industry. This acid-free agent molecularly bonds the old surface with the newly applied, advanced acrylic coatings. It also eliminates the need for dangerous and toxic etching acids, which are often used in other kinds of refinishing processes. Another great thing about this process: it’s durable and effective. In fact, it’s been proven to extend the life of fixtures for up to 15 years, it’s a fraction of the cost (and the mess) of replacement, and it comes with a 1-year warranty. We also use special procedures to remove dust particles and polish the surface—it’s something we do to go the extra miles for our customers. It also sets us apart from our competitors. If you’re interested in having your kitchen sink, countertops, or bathtub refinished, give us a call at 1-888-271-7690.